5m x 25mm Heavy duty weather-resistant nylon webbing Quick-release high-tension handle Double..
6m x 50mm Heavy duty weather-resistant nylon webbing Quick-release high-tension handle Double..
8m x 50mm Heavy duty weather-resistant nylon webbing Quick-release high-tension handle Double..
10m x 50mm Heavy duty weather-resistant nylon webbing Quick-release high-tension handle Doubl..
High strength flat webbing single slings with reinforced lifting eyes. 100% PES polyester. 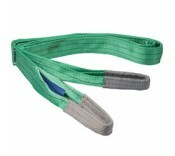 Conf..
High strength flat webbing single slings with reinforced lifting eyes. 100% PES polyester. Co..